Women’s Basketball Wins Conference Title | The Gettysburgian. (Photo courtesy of Gettysburg College Athletics). 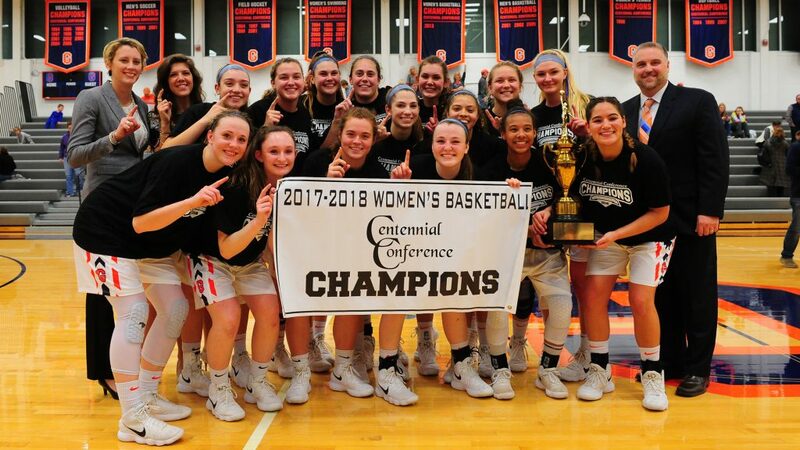 The Gettysburg College women’s basketball team has had a season to remember in 2017-2018. However, this Saturday the team’s heroic season came to end at the hands of the Montclair State University by a score of 70-45. The Bullets earned a birth to the NCAA Division III tournament after winning the Centennial Conference Championship last Saturday against Haverford College. This Friday the Bullets were challenged and, at the end, toppled Albright College in the first round of the NCAA Division III National Championship. The game against Albright College was highly competitive. Gettysburg came out with scoring on the brain. The Bullets had a hot first quarter in which they opened up a 12 point lead to start the game. The Albright College Lions answered the Bullets fast start in the second and third quarter, and by the start of the fourth, the game was tied at 49. Thanks to the combined efforts of a three-point knockdown by junior Emma Dorshimer and a 8-0 run by senior captain Emily Gibbons in the fourth quarter, followed by a scoring drought by the Lions on their final four possessions of the game, the Bullets were able to pull out a 74-64 victory at the end of regulation. Gibbons, Dorshimer and junior guard Ashley Gehrin led the Bullets in scoring. Gibbons had 21 points and single handedly outscored the Lions 11-9 in the first quarter. Gehrin had 17 points and Dorshimer had 14 points. Dorshimer started the game off slowly but was able to gain momentum when she hit her first three-pointer of the game in the third quarter—a bucket that helped her break the all-time record for three-pointers made by a Gettysburg College Women’s Basketball player. It was Dorshimer’s hot second half that helped the Bullets prevail against the tough Lions team. The women’s team was then tasked with the difficult assignment of playing two games in back-to-back nights. The 22nd nationally-ranked Bullets faced off the next night against the 16th ranked Montclair State University Red Hawks in the second round of the NCAA Division III National Championship. Prior to this game and earlier in the week, three Bullets were named to the All-Centennial Conference Team. These three players were once again Gibbons, Dorshimer and Gehrin. While the Bullets had to leave home to play their second round match-up, the Red Hawks hosted the tournament and had home court advantage for their game against the Bullets. The Red Hawks came out of the gates hot. At the end of the first quarter, the Bullets trailed the streaking Red Hawks 18-9. The Bullets held tough in the second quarter, but ultimately were unable to muster any sort of momentum to stop the Red Hawks’ offense. The Red Hawks converted 63.2% of their field goals attempts, and shot a high percentage, 55.6%, from outside the three point arc, to defeat the Bullets. In his short three-year tenure, Coach Nate Davis has brought life back to the women’s basketball program at Gettysburg. This season was the first time since 2003 that the Bullets had made the post-season tournament, and only the sixth time in the program’s history. Before the loss to Montclair State, the Bullets had racked 15 wins in a row. Matt Hutcheon '18 decided to join The Gettysburgian in his final year of college because he has always had a passion for writing. He was an editor for my high school newspaper, The Mast, and decided that he wanted to do newspaper writing again before his time at Gettysburg College ended.A n Organization and Management Studies major and a History minor, he resides in a small town on the coast of Maine just outside of Portland called Falmouth. He is a member of the Greek Organization Phi Delta Theta, and is currently a Supervisor for the intramural program as well. He is excited to join The Gettysburgian team, and he hopes that you all enjoy the sports articles he writes this year.